Weekends and Holidays 9:00 a.m. until dark this year. 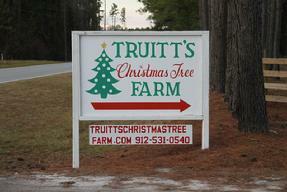 Truitt's Christmas Trees are excellent in quality and are a great value! Size and Quality determine pricing. Stop by today and pick out that perfect three for the christmas season. We will be glad to help choose, cut, trim and load for you to take home.